Benjamin Childers, son of Dakota Childers and Samantha Amyx. 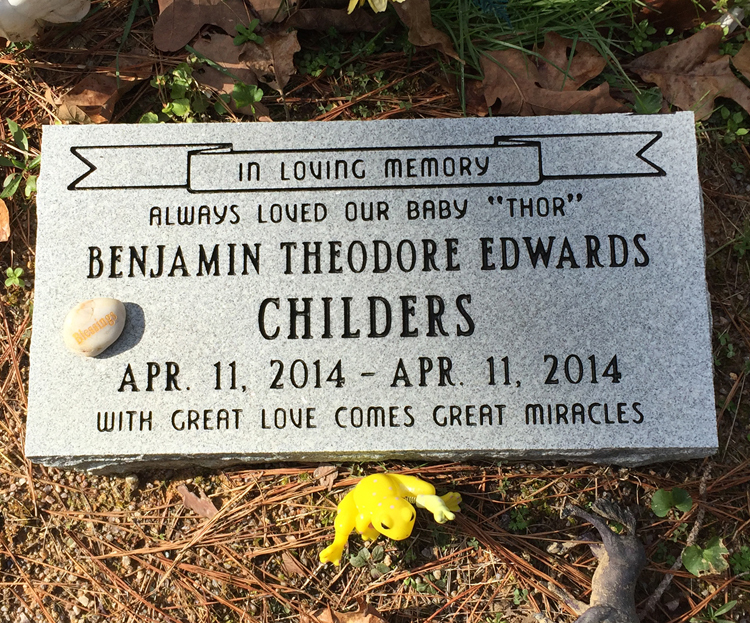 Infant Benjamin "Thor" Theodore Edwards Childers, passed away on Friday, April 11, 2014 at Cartersville Medical Center. Graveside services are scheduled for Sunday, April 13th at Old Macedonia Cemetery with Rev. Travis Childers and Rev. Gary Henson officiating. He was preceded in death by, great grandparents Willie T. Tanner and Elbie Clyde Tanner. great grandparents- Ralph & Mamie Childers, Waleska; Edward Brownlow Amyx, Rutledge, TN; Mertle Turner, Blacksheer, GA.
South Canton Funeral Home, dedicated to the families we serves.